Brady, Mable, head-of-household, age 30, born in Kansas; parents born in Illinois; owned home; occupation: laundress, own home. Newfarmer, Geneva, daughter, age 10, born in Kansas; father born in Ohio; mother born in Kansas; attended school. 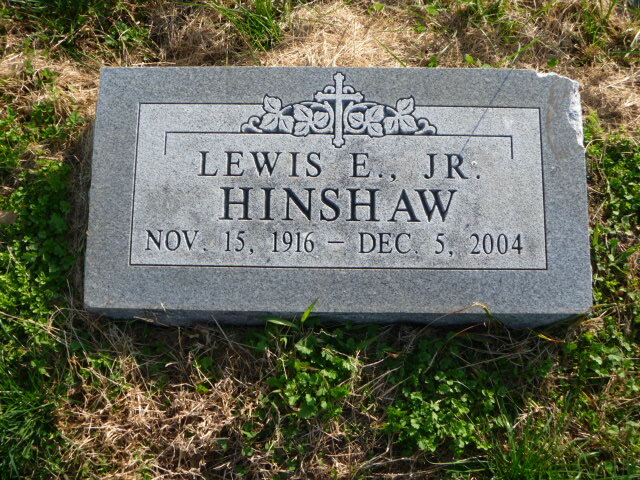 Hinshaw, Lewis E., nephew, age 3 years 1 month, born in New York; father born in Kansas; mother born in Massachusetts. Brady, Mable, head-of-household, age 41, born in Kansas; parents born in Illinois; divorced; owned home ($3000 value); no radio in home; occupation: none. Hinshaw, Le[..smudged..], nephew, age 14, born in New York; father born in Kansas; mother born in New York; attended school. 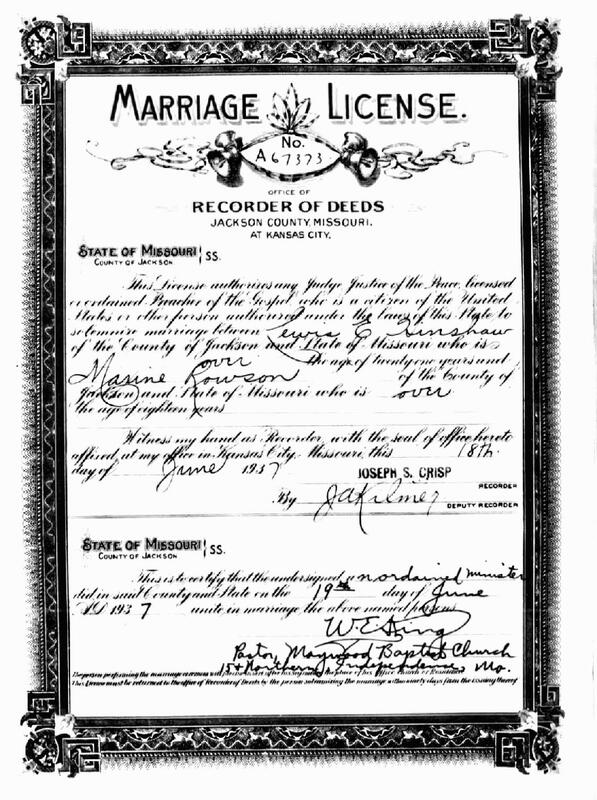 Obituary of Lewis Everett Hinshaw, Jr..
1920 census, Kansas City, Jackson County, Missouri; roll T625-924, ED 199, page 8A, line #34, dwelling #172, family #185. 1930 census, 13th Ward, Kansas City, Jackson County, Missouri; roll T626-1201, ED 207, page 17A, line #45, dwelling #11, family #11. Obituary of Richard K. Rowson, "The Kansas City Star", Sep 7 1997, pg C9. 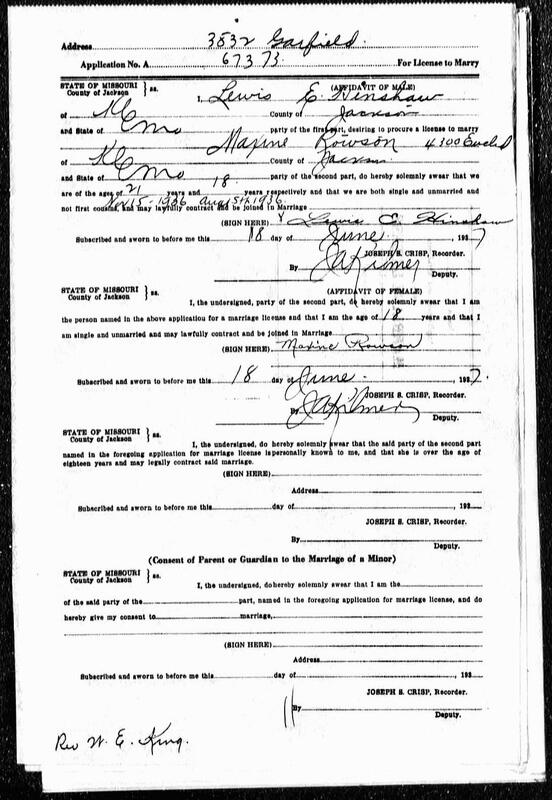 1920 census, Dalhart Township, Dallam County, Texas; roll T625-1790, ED 46, page 2B, line #77, dwelling #41, family #44.